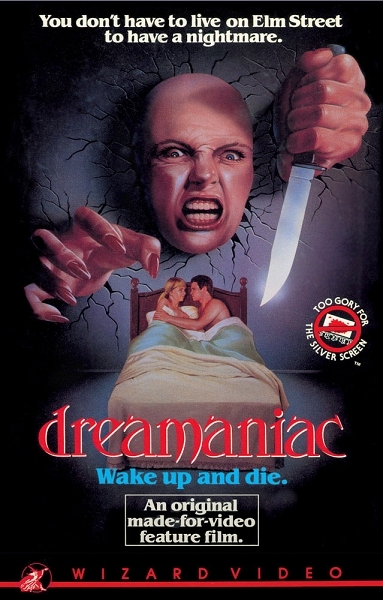 In the sleep-stirring tradition of PHANTASM and A NIGHTMARE ON ELM STREET, DREAMANIAC introduces Lily, a deadly leading lady who makes Freddy look like a bargain basement boogeyman! Adam is a heavy metal rocker and part-time Satanist. When Lily enters his dreams, he uses black magic to summon her into reality. Too late. Adam learns that Lily is a succubus, a demon seductress who makes love to men and murders them though not necessarily in that order! When she crashes Adam's sister's sorority bash, the blood flows and the body count rises. But Adam, entranced by her power, soon faces a tough decision. Will he break free to save his sister and her girlfriend or will he experience the ultimate sensation of loving Lily...?